Oil Painting with Cecy Turner 2018 - Sign Up Now! In this workshop we will concentrate largely on UNIFYING A PAINTING by working on achieving color harmony. This will not be a "color workshop," as I don't believe that color is THE most important thing in a painting. However, color harmony is many times the thing a person who views a painting will love about it and not even realize it. We will not be using a "mother color" and adding it to every color we mix; instead we will focus on what I call "bending a color." Also in the workshop, composition, focal point and ways to lead the eye around the painting will also be stressed to further unify a painting. "Loved your teaching style! Step by step instructions were so helpful. I also overheard you speaking with others in such a positive manner. I'm sure there were times you struggled to think of something positive to say! Thanks so much for the individual attention!" "Thanks for a great workshop! I love the way you paint, the varied colors you use, and how it all flows together. One day I hope to achieve the same fluid way you paint." "Great instruction! I like the way you made us look at colors and shapes beyond what we actually see. You renewed my faith in me!" Cecy holds her Signature Membership in the National Watercolor Society, Southwestern Watercolor Society, National Oil and Acrylic Painters Society, American Plains Artists, American Women Artists, Associated Creative Artists, Outdoor Painters Society, Plein Air Artists Colorado, and Texas and Neighbors. 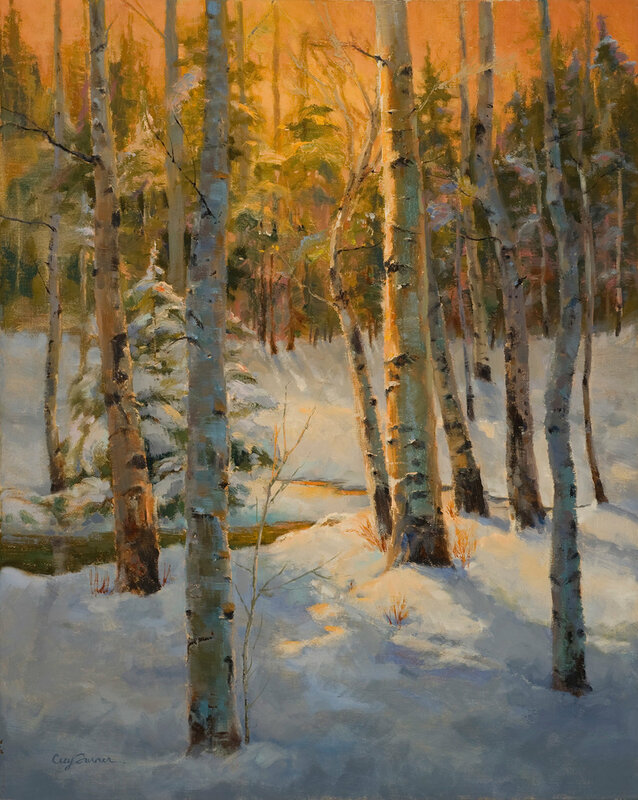 She is a Master Signature Member of Women Artists of the West and a Fellow of the American Artists Professional League, as well as a member of Rocky Mountain Plein Air Painters. Articles about Cecy have been published in American Artist Magazine, Watercolor Artist Magazine (cover, February, 2010 issue), Southwest Art Magazine, Art of the West Magazine, Western Art Collector, Home and Heritage Magazine and North Light Magazine, and her work has been featured in The Best of Flower Painting. She was chosen as an “Artist to Watch” by Southwest Art Magazine in their July, 2006, issue. Canvas: Cotton canvas is fine for class, or canvas panels. Sizes: 9x12, 11 x 14, 12 x 16. Canvas panels are very absorbent, so put three coats of gesso on them, letting dry between each coat. You don't need to gesso linen canvas, but linen is a little pricey to bring to a workshop! Note: Smaller is preferred so we can get a couple of "starts" and one "finish" each day. Medium: I usually don’t use a medium, but I’ll bring Res-N-Gel for everyone to use. Some mediums, like Liquin, have too much odor to use in a class, so please don't bring. Scraps of canvas or a couple of 8x10 canvas boards for "Unifying a Painting" demonstration - we will do a couple of "paint alongs" to practice bending a color to unify the colors in your painting. Also, pieces of gessoed watercolor paper will work or Arches oil paper (available at art supply online stores below and at Asel Art Supply). Sketchbook, Sketch pencil, Eraser for your notes and small thumbnail sketches and line and value studies of your “plan.” Bring a soft pencil for your dark value in your value plan. Easel – Bring table easel (preferred if you don't mind sitting to paint) or stand-up easel. There are tables and chairs in the room . Turpenoid or Gamsol by Gamblin (NO REAL TURPENTINE or odorless Paint Thinner, PLEASE!!) You may bring in glass jar with saran between the jar and lid so it won’t leak) The odorless mineral spirits from the hardware store is NOT really odorless. Photos: Try to bring some photos of simple landscapes that you can clearly divide into 3-5 shapes if you squint. We'll do abstract block-in before we begin each painting. I'll also bring or email some landscapes you can use if you can't find anything.